The SP-746 is identical to our SP-H20 headset except for the detachable cable feature. This light weight and rugged headset can withstand the rigors of busy clubs. 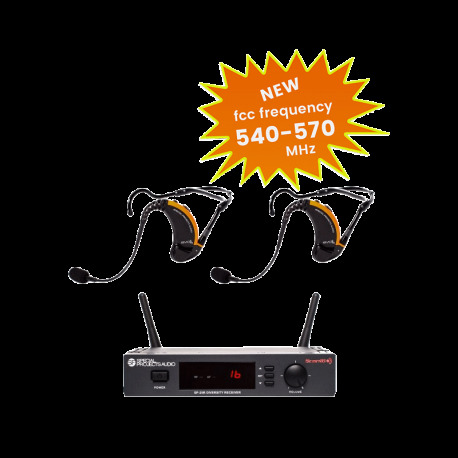 The SP-746 will provide years of dependable use and there isn't a limit on the number of classes per week this headset can handle, put it to the test this unit is a workhorse. An extremely comfortable headset that stays in place even during the most rigorous exercise routines, the noise cancelling mic element prevents troublesome feedback and provides great sound quality. The SP-746 can be used with every brand of wireless system. Perfect from smaler group exercise, at 40W the SP-GXE-Lite delivers high quality sound in a a super light weight system. The EVO True Wireless System has been a favorite of fitness instructors and performers for years. Water resistant and rechargeable the EVO offers a patented design that allows freedom of movement without a cable or body pack transmitter. The EVO is lightweight, comfortable, and stays in place even during the most rigorous exercise routine. The patented behind the ear design never interferes with floor exercises. The electronics have been completely redesigned to conform to the new FCC guidelines. The SP-EVO-25 Auto Scan true wireless system is the easiest system to setup and use. The receiver finds the strongest channel and all you have to do is set the headset to the corresponding channel and its done. The EVO remembers the setting and you never have to reset the channel. The H20 head worn microphone with replaceable cable can be used with every brand of wireless system. The H20 is the smartest choice for fitness facilities, this mic will provide years of dependable service even under the most rigorous use. There is no limit to the number of classes per week you can use this mic, this unit is a work horse. The H20 is the best value headset in the world. The H20 is rugged, dependable, extremely comfortable, and stays in place even during the most rigorous fitness routines. The noise cancelling element provides excellent sound quality and prevents troublesome feedback. The replaceable cable feature prevents any downtime due to a faulty mic. If a problem arises simply replace the detachable cable and you are back up and running in minutes rather than having to send the entire mic in for repair. The SP-256-H20 wireless system is specifically geared for aerobic instruction. Our dependable Auto Scan receiver with body pack transmitter has been coupled with our SP-H20 headset for a system ideally suited for the fitness industry. The user replaceable cable feature of the H20 prevents any downtime due to a broken cable. This system is easy to set up and maintain. Turn the receiver on and the Auto Scan receiver finds the strongest available channel and locks on, then set the body pack transmitter to the corresponding channel and its set. The unit remembers the settings even after it has been turned off. The dependability, versatility and ease of use with the Fitness pack, make this the preferred body pack system for fitness facilities. Waterproof / sweatproof SP-H20 headset with replaceable cable. retractable handle and durable wheels let you use this system almost anywhere - inside or out! Includes storage case.